These documents from 1954-56 pertain to the minor league baseball career of Ted Worthington, then of rural Lecompton, Kansas. 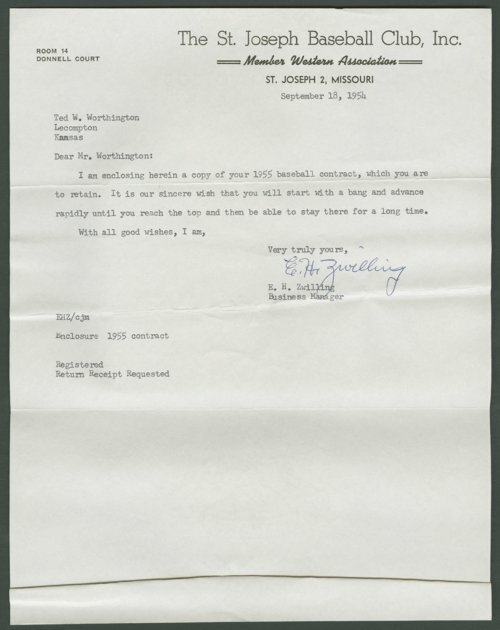 His original contract was issued by the St. Joseph team of the Western Association; its terms for the 1955 season called for a $200 monthly salary and a $1,000 signing bonus. Before the 1955 season started, contract rights to his services were optioned to Binghamton (NY), Monroe (LA), and finally to the McAlester Rockets of the Class D Sooner State League in Oklahoma. Worthington, a left-handed pitcher, played for the Rockets in both 1955 and 1956, compiling a 5-10 record, with an ERA of 4.92. Following his professional career, he played semi-pro baseball and fast-pitch softball, and was active in Suburban League youth baseball. A long-time resident of Tecumseh, Worthington worked 36 years for Santa Fe Railroad. Digital reproduction of the photograph was accomplished through a joint project sponsored by the Kansas Historical Society and the Shawnee County Baseball Hall of Fame.